The first thing you noticed was the name. Can’t say it, no matter how hard I try. The second thing you noticed was the style. Can’t match it, no matter how hard I try. The third thing you noticed was the skill. Can’t believe it, not matter how many times I look. The last thing you noticed, and the thing you didn’t expect, was the passion. Couldn’t love it more. It’s everything I want. It’s the passion that made all the difference. The grainy highlight video (you remember this one, don’t you?) showed the midfielder doing two things. The first was scoring goals, a talent which Medunjanin certainly has but isn’t necessarily a requirement of his deep-lying role. Former Union man Vincent Nogueira. Though nothing ever really repairs a broken heart, Medunjanin helped Union fans move on. In love and lost midfielders, circumstances change, other people pull your attention away, and suddenly you wake up (and though the hurt is still there), and the pain is just something that happened to you instead of something you’re in. Haris Medunjanin did that for Union fans. You certainly remember his rocket against D.C. United last year. Maybe you prefer his “cool as a cucumber” right-footed finish against Montreal this season. You were about to write a comment on how Medunjanin doesn’t play defense, weren’t you? But what about this goal directly off of a turnover? The list of his on-field successes is long, and each highlight is better than the one before. In reality, no pass, shot, or defensive play could ever be enough to do what Medunjanin has done. Soccer is soccer, and there are players all over the world who make highlights. Medunjanin helped Union fans move on, helped the Union franchise move forward, and earned his place among Union greats because he cared. He didn’t just sign a contract to play for the Union. He signed a contract to be a Union player. 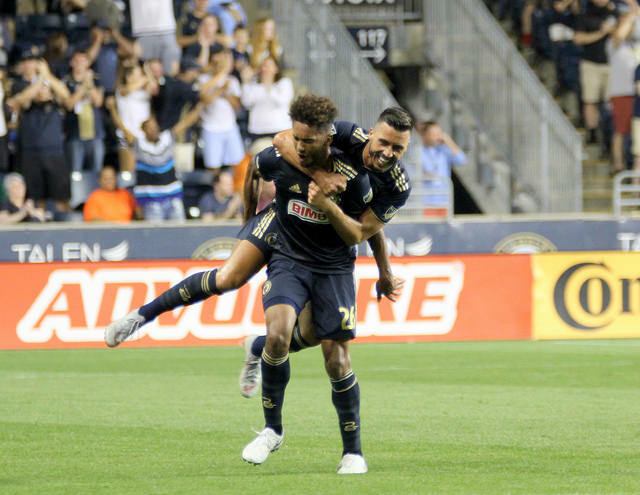 His red card in Atlanta earlier in 2018 was shocking, irresponsible, and among the most salient moments in Union history. Match referee Sorin Stoica, a man whom Medunjanin had helped (through honesty and fair play) not a year prior, had wronged Medunjanin’s teammates in a pivotal match. Rather than allow Major League Soccer officiating to be the unreliable monster that it was then and has continued to be, he stood up for teammates in the most visible way possible. He paid for his transgressions with a red card and a three-match suspension. One writer at this publication argued the match that followed was the gutsiest match in Union history. His frustration, his disdain, was that of every Union fan in that moment: Fuming and pulsating, a rage of anger at a rolling boil. It was Pete Rose rounding third and barreling home. It was Allen Iverson crossing over Michael Jordan and breaking his ankles, and then stepping back and doing it again because he could. It was Brian Dawkins leaping to make a tackle when a simple dive might have sufficed. Medunjanin wrote his name in Union lore that day and has continued to do so every day since. The Union have their engine now, their firebrand, their spark. Most importantly, the Union’s No. 6 is a man whose passion goes beyond his physical contributions. In Medunjanin, the Union have a talent who supports, mentors, and celebrates in the team’s youth development pipeline. In a profession rife with backstabbing and an every-may-for-himself mentality, this type of magnanimity is beyond rare. The most shining example came just recently. After Austin Trusty’s first goal (against Montreal just last week), the rookie was obviously excited. Before Trusty could make it to the sidelines to celebrate with his coach and teammates, Medunjanin ran all the way from the far corner to catch Trusty, jump on his back, and beam a bright smile of cathartic excitement. Just the memory is making you smile right now. The picture is just icing on that delicious cake. 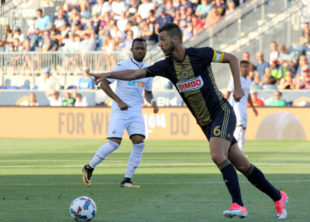 Haris Medunjanin is who the Union are now: here because he cares, playing hard because it matters, and fighting for each of his teammates in joy and sorrow for their collective, greater cause. The Union’s No. 6 is the kind of player you could build a franchise around. It’s almost like the Union are doing just that. Author: Chris Gibbons Father of two, husband of one, co-host of the All 3 Points podcast (@all3points), largely right footed one-who-misses-sitters, enjoys all manner of bourbon and red wine, as well as the no-longer-available Talen Energy Stadium concession, "El Golazo." Captain of noted PSP feeder club, West Philly FC, only because all the other potential captains moved away, got hurt, or retired altogether. Thank you for a very perceptive and accurate report. I said to coach Curtin last year as a fan, for him to built the team around him as much as possible. For my own observation you can see his skill and demeanor is in a class above. I also have a pix with Haris and asked him if he will stay here and he said yes. So indeed with the current blending and meshing all the parts into a well oiled futball team is worth the price of admission.